Maybe due to the continued efforts to keep Facebook on top due to the competition from Google plus, the Facebook team added a new feature which allows a user to subscribe updates of other profiles. They introduce new subscribe button which let a user receive the public postings of any specific profile. It is not like welcoming all junk posts of the subscribed user, but you can specify which type of updates you want to receive. There are 3 options "all updates, most updates and only important" are available. You can select either one of the options at the time of subscribing to a profile. Many believe the new feature resembles the Twitter. It is because the new Facebook subscribe option performs the same duty of tweets from a followed user. 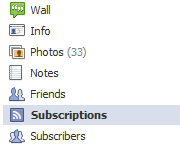 We cannot see the "Allow Subscribers" button for all Facebook profiles. Users should enable this option first to show subscribe button on their profile. It is to protect the privacy of a user if he doesn't like others receive his public postings. It is also important to note that any uncontrollable information outflow may risk our privacy. A good marketer or hacker can gather sensitive information by constantly analyzing our activities by subscribing to our daily updates. They can use that information for their benefits. That is the reason by default no one can subscribe button displayed for our account updates. If you like to enable the subscribe button for your Facebook profile, follow the steps below. To view updates from subscribed users, click on subscriptions below friends. To read more about this new feature click on the link below.